I used to work in a shopping mall and spent all my measly paychecks on CDs and Panda Express. 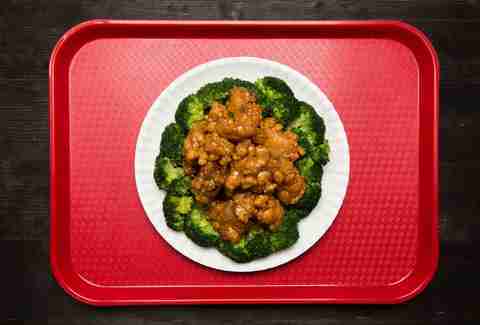 For me, the lure of orange chicken with chow mein was stronger than Cinnabons and Auntie Anne's pretzels rolled into one. I know, because I had to walk past both to get to Panda Express. Look, I know this isn’t even close to authentic Chinese, but if it’s the fried-meat-soaked-in-sugary-sauce kind of Chinese you're hungering for, Panda is king. After many experiments, I finally got the batter just right. No, it doesn’t get soggy. Never. Ever. And the sauce is perfectly tangy and sweet, like the real deal. Don't even pretend like you don’t love this stuff. Beat egg whites in a medium bowl until foamy. Add soy sauce, wine, and milk; whisk to combine. In a large bowl, combine flour, cornstarch, baking powder, and salt in a large bowl. Whisk until homogenous. Add wet ingredients and whisk until mixture has coarse, mealy clumps; set aside. Working in batches, dredge chicken in dry coat mixture, tossing in between each addition to coat chicken. When all chicken is added to dry coat, toss with hands, pressing dry mixture onto chicken so it adheres, and making sure that every piece is coated thoroughly. Lift chicken one piece at a time, shake off excess coating, and carefully lower into hot oil. Cook until chicken is cooked through and very crispy, about 4 minutes. Transfer chicken to a paper-towel-lined bowl to drain. 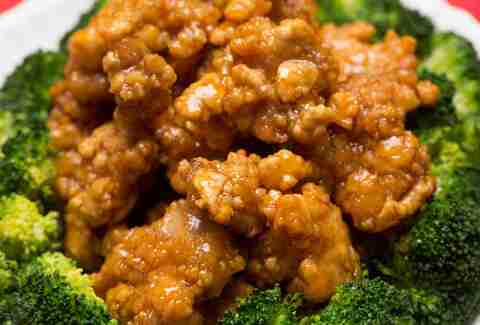 In a liquid measuring cup, combine sugar, vinegar, soy sauce, Shaoxing rice wine, sesame oil, and orange zest. In a separate bowl, dissolve cornstarch in ⅓ cup water and set aside. Add 2 teaspoons oil to a wok or large frying pan over medium-high heat, add garlic and ginger; cook for about 10 seconds. Add crushed red pepper and orange sauce; bring to a boil. Add cornstarch mixture; stir until it thickens, about 30 seconds. Turn off the heat. Toss fried chicken in the orange sauce until completely coated. 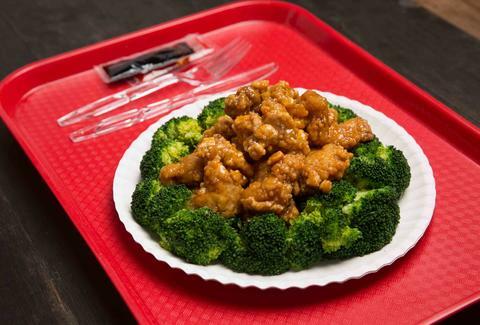 Serve immediately with white rice and steamed broccoli. Perry Santanachote is Thrillist's recipes editor. Follow her at @perrysant.